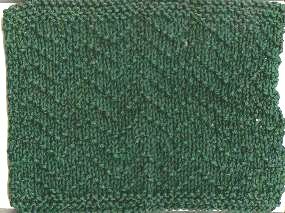 Row 1 - 4: Knit across. Row 5: P1, K3 across. Row 6: K1, P5, K1, P1, across the row. Row 7: K2, P1, K3, P1, K1, across. Row 8: P2, K1, P1, K1, P3*. Row 9 - 36: Repeat rows 5 - 8, 9 more times. Rows 37: Repeat row 5. Rows 38 - 41: Knit across. Rows 42: Bind off in knit.